Class activity: Cloudstreet and Winton. Teachers should lead a discussion considering the following ideas. Cloudstreet is perhaps one of the best known Australian novels and it is often considered not only a modern Australian classic, but a favourite of Australian readers. It is often ranking first in many public polls of the best Australian novels. As a class, brainstorm what students already know about this novel (its ideas, setting, characters) or about its author and his other projects. Homework or group activity: Perth – City, Region and Nation. Cloudstreet is set in a particular time and a very specific place and while it is sometimes seen as a very regional representation of Western Australia, or Perth in particular, it is the national relevance of the narrative and its universal nostalgia that makes the novel such a national favourite. While it is enjoyable to allow the novel to help students to explore this context, it might be helpful for them to research some elements of the novel’s context so that they can make sense of the references in the novel. Students should complete the following activities. Locate each of these places within Western Australia – Geraldton, Margaret River, Southern Cross, Nedlands, West Leederville, Fremantle. Then write a summary of any observations you make about their location, geographic position or unique situation. Create a timeline of the years over which the novel takes place (1943 – 1963). Place on the timeline any global, regional or local events of significance. Look up the term nostalgia and consider why Tim Winton has chosen to write about this specific time and place. Individual writing activity or task: Students should investigate the biblical figure of Samson. As homework, or as a class activity, they should write at least one paragraph summarising the story of this figure, as well as one paragraph predicting how this figure may be connected to the novel Cloudstreet. Individual writing activity or task: As you study the novel with the class make an activity of following ‘The Shifty Shadow’ that is first introduced to the reader on page 7. Note the way in which fate is part of this narrative and how different characters react to the concepts of fate. At the conclusion of the first reading of the novel, students should write a summary of their responses to ‘The Shifty Shadow’ and whether they believe in the power of fate. Class blog/wiki: Create a shared space for the class where students can contribute ideas as they read the novel. The space could be arranged with the following headings to give students a prompt of what to comment on or write about: Family Saga, City and Country, World War II and Australia, Patriotism and Religion and Beliefs, Water, The House and Cloud Street, Haunting. Class discussion and individual writing activity or task: This novel is unmistakably Australian. From the voices it creates, to the settings it occupies, to the history it tells, this is an Australian novel. As a class consider the idea of ‘Australian identity’. It is important that the teacher carefully guides the student discussion of the following prompts. What are the archetypal representations of the Australian character in literature? Where might these ideas originate? Do you recognise this representation of Australia in any other works of literature or popular texts? Does the traditional Australian identity neglect any groups within Australia? Individual writing activity or task: As students finish reading the novel they should write a one page response to the ending. This is designed to be an immediate response to the resolution of the novel and a personal response to Fish’s departure, Oriel’s return and the continuation of the family. It should be entirely free in form so that students can express their personal response and record it for comparison after studying the text more closely. This is also designed to serve as an exemplification of reading practice: that we read for different purposes at different times. Circular narrative: Cloudstreet takes place over a long period of time but it is told in an instant or ‘in the seconds it takes to die’. It is helpful for students to always have this concept in mind when considering the plot of the novel and it is this point that always unifies what could be the unwieldy narrative of this family saga. The opening and closing of the novel are critical to this narrative construction and should be the focus of close class analysis. 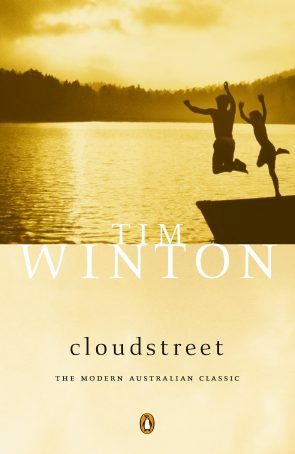 Family saga/epic genre study: While the timescale of Cloudstreet might not qualify it conventionally as epic in the traditional sense of the genre, Winton’s novel works within this genre. The points below will direct a study of this novel in relation to the genre. Consider the essential elements of this genre and discuss the ways that the novel operates within it, providing textual evidence of where it is functioning within the expectations of the genre and where it might subvert or even parody the epic. The epic in Australia literature is often constructed as a family saga. Students should investigate other examples of the family saga in Australian literature and television. Three helpful close studies that teachers might explore are Merry-Go-Round in the Sea by Randolph Stow (also set in Geraldton which would provide some interesting comparisons and insights), The Tree of Man by Patrick White andThe Songs of a Sentimental Bloke by C.J. Dennis (referenced by Winton on p. 302 of Cloudstreet). Timeline activity: In many ways the chronology of the overall plot is less important than the individual and personal histories of each character that unfold within Cloudstreet (the house). Students should take each of the pivotal characters of the novel (Oriel, Lester, Quick, Fish, Sam, Dolly and Rose) and create individual timelines for the 20 year period (this might be done by dividing a class into groups for each of the characters). These timelines should all use the same scale so that they can be placed alongside each other, as well as the timeline of the historical context created earlier. As a class discuss the way that the individuals’ stories are intertwined and interconnected. A timeline of the house might also be made as a way of connecting all of these ‘characters’ of the novel. Close analysis of characters: Adding to the timeline created above, each character’s story can be explored further by locating important moments in the text where ideas about the characters are revealed. These moments can be placed on the timeline by providing page references or quotations. In addition students should create a table for each character where these textual examples are analysed. Below is an example of how this might be done. Other characters: Aside from the members of the Lamb and Pickles families, there are other characters that have significant, if minor, roles in the novel. As a class consider the function of the house and the river as characters in this novel. Both of these figures are more than symbols in the novel, they function in the same way as a character. They live and breath, as well as affect the human characters and the plot of the novel. There are also ghostly characters that have an important place in the reader’s experience of the novel, such as the ‘old woman’, the ‘poisoned Aboriginal girl’ and the figure of the Aboriginal man that Quick continues to meet. Direct students to consider the impact of each of these figures and, as a class, discuss the importance of having these mystical influences in the novel. Student scaffold: As themes develop throughout a novel it is important that students can trace this development through the organised collection of information. There are a number of significant themes in the novel, some of which will be highlighted through the close reading practices of teachers and readers. Some themes that could be explored are: spirituality, life, family, loss, the ‘ordinary’, return, community, fate, love and identity, but this is not a finite list. Below is a table that students might use to trace each theme they identify. Draft statements of the theme as you go along Describe the moment in the text when you realised this Specific example from the text that supports it What reaction do you have to this idea you feel the text is communicating? Do you accept this idea or challenge it? Using one of the following sections from the novel, students will explain how it embodies the one or more of the main ideas of the novel. Teachers might wish to add other sections of the novel to this list. Winton’s writing style is considered distinctive and Cloudstreet gained much attention and praise as an Australian novel at the time of its publication. Both Winton’s reputation and the response to the novel can mainly be attributed to the style of the writing and the way that traditional constructions of literary form are blended for particular affect. As described earlier in this resource, the structure of Cloudstreet is circular. It ends at the point at which it began. Ask students to cite examples of this narrative structure from their own reading and viewing and consider the effect that the choice often has on the audience. Writing exercise: Students should experiment with this device by creating a small autobiographical passage. It might be a moment of reflection where the narrator goes back to explain the story so that the location and future actions will make sense or have significance. It might be a moment of revelation that has only been achieved by piecing together information from the past. This passage should be no more than a page. As has also been explained earlier in this resource, the personal histories of the characters of Cloudstreet are the entire narrative. It is their stories and the way they connect that creates this larger story of two families in post-war Perth. Aside from their chronological journey, it is their individual construction which enables Winton to breath life into each individual. It is not just what they represent that endears them to the reader, it is how they are portrayed. Student activity: After choosing their favourite character from the novel students should select four scenes in which something is revealed about them and locate them in their copy of the novel. Looking at how the language brings the character to life, students should note the different ways that similes, metaphors and descriptive language are used. For example, when describing Dolly Pickles at Rose’s wedding we read, ‘Dolly Pickles plots a course and tacks down the aisle to her seat at the front, great spinnaker of a hat resting at last’ (p. 319). This description is not the usual metaphor you would expect of a mother of the bride. The nautical connotations portray Dolly’s actions as calculated, strategic, but also as listing and rolling in her perpetual intoxication. This one sentence reveals much about this character at this critical moment where all of her individual stories converge. This is not a neutral description but one that makes us wary of Dolly and what she may do on this occasion. Instruction to students: locate four examples for their chosen character. Explain what they reveal about the character or ideas within the text and how this is achieved. Class activity: Below is a list of helpful sections to analyse for each of the major characters within Cloudstreet. The scenes have been chosen as moments of illumination about the character and because they also have significance to the development of the main themes of the novel. After considering each scene, or similar scenes of their own choosing, students should be asked to write a paragraph synthesising the way that character construction assists a reader’s understanding of a novel’s ideas. What does this do to the narrative as it unfolds? What moments in the text give us clues as to the significance of this as contrast as a device? Why is the empty room with the piano known as ‘no man’s land’ and why must it be there? Why is there a Samson or Sam in each family? What is the function of bringing the families together? What is the importance of Harry? Class activity: While we know that this story is told ‘in the seconds it takes [Fish] to die’, the use of narrative point of view is varied in this text. The narrator is ambiguous and omniscient, but from time to time it rests with Fish. Guide the class through a discussion of the significance of this fluid use of point of view and consider the passages on pages 47, 119 and 178 (close readings of these passages would make help students to develop critical analysis skills). One of the distinctive elements of Winton’s work is his choice of language. His stories are often described as a ‘yarn’ and the use of Australian colloquialism immediately locates his work in a particular time and place. Class activity: Read the opening of Chapter Two out loud to the class and ask students to annotate the obvious use of the Australian vernacular in this passage which is less than half a page in length. Students should consider the effect of each term, the imagery that is created and how the reader is positioned to response to such language use. Locate other passages to analyse in this same way. Student activity: Complete the table connecting important symbols or motifs with the characters and ideas of the novel. As a timed, classroom activity students will be given a copy of Chapter Two p. 26 – 32. After reading the passage and annotating the use of narrative devices, students should answer the following question with close reference to the passage. Explain how the use of narrative devices positions the reader to understand ideas about family in the passage? It is possible to apply various perspectives or lenses to our of reading of Cloudstreet and each one will provide new insights into our understanding of the text. Below are some different ways of approaching the novel for the purpose of demonstrating reading practices. Often we read a text from our established expectations of a genre. The result of this is that we feel disappointed when a novel fails to adhere to the prescriptive elements of the genre. However, sometimes we applaud the writer for being so clever as to transgress the confines of the genre or we might even feel that there is a statement created through the use of a genre. In the case of Cloudstreet we can consider a number of genres when we construct a generic reading. With the class, investigate the prescribed elements of theepic, crime and gothic genres. The purpose of this investigation is not to label the novel as fitting within a particular genre, it is instead to look at the way a genre might be evoked, the effect this might have on the audience and whether there is a comment that might arise out of this use of genre. For example, in the case of the epic, Cloudstreet does not adhere to the generic features of a poetic epic, but it is often described as national epic. It would be helpful to discuss the elements of the novel that lead commentators to make these claims, such as the journeys of the characters and the heroism that they display. What might be occurring here is that the heroism is very much an understated, ‘ordinary’ world form of survival and compassion. Rather than the traditional grandeur of the epic, there is a grandeur of Australia’s geographic context and a transgressing of time and space, so that Cloudstreethas more an epic quality rather than subscribing to an epic formula. It might be that we consider this an Australian epic – a story that represents the grandeur that this nation values. A gender reading considers the way in which characters conform to or subvert the traditional gender stereotypes of the society depicted. Oriel Lamb makes an interesting case study in relation to gender. Consider the way that she is denied her maternal role in relation to Fish: she controls the family and supports them with her hard-working ethic, but lives separate from the household. She does contain the feminine insight of delivering Wax Harry but in the process is described in an almost unfeminine way with ‘her hairy bum showing shockingly’. Dolly Pickles and Rose offer interesting comparisons to the feminine construction. Lester Lamb and Sam Pickles also provide differing views of masculinity. Quick Lamb‘s character is also worth exploring. It is important to remember that a gender reading is not purely an observation about the gender construction of character, but it should be an assessment of the ideas promoted by the text about gender. This provides an opportunity to also explore resistant reading with students. A helpful section to explore is ‘How Small Our Dreams Are’ (p. 326). Applying the reading lens to the concept of ‘Australia’ within Cloudstreet enables students to consider the importance of national identity to the ideas promoted by this text. By exploring Australia’s national identity and its literary traditions, students will see that this novel operates within the space of ‘Australia’ and may even be considered a national monument – a construction in memory of the nation. To explore this reading students should consider the way that patriotism functions alongside spirituality, the mythical representation of Australia’s past and the enchanted construction of the Indigenous figures. When considering contextual readings of any text students should understand the three contextual influences on reading: the context represented, the context of production and their own context as a reader. Interesting readings can be produced by considering Winton’s post-bicentennial writing position, the importance of nostalgia in modern Australian readers and readers for whom the ‘traditional’ Australian stereotypes are far from their own experience of Australia. Winton, like some other contemporary Australian writers, is influenced by other writers from the periphery. A group of South American artists and writers began to explore the concept of magical realism in the early 20th century. Australian comparative examples: Australian writers who also operate in this style might also provide interesting passages or entire texts for comparison. Two possible texts to compare with Cloudstreet are David Malouf’s Remembering Babylon and Peter Carey’s Illywhacker. Other points of comparison between these works are in relation to national allegory and ideas of nation. International magical realist writers for comparison: Jorge Luis Borges, Toni Morrison, Julio Cortazar and Salman Rushdie are all helpful to make comparisons with Cloudstreet. Explain your response to the alterations to the novel’s narrative. Consider the difference between the visual representation of people and places and the prose description and discuss your findings. Discuss whether you think that the magical realist elements of the novel can transfer to stage and/or screen. Write a letter to the producers of the film and/or play describing your views of the production. Debate: Create groups of six students to debate the topic ‘Cloudstreet is representative of Australian culture’. Three students will argue the affirmative, three students the negative, in accordance with formal debating rules. See the activities above related to national readings and magical realism. Read the section entitled ‘Red’s Method’ (p. 126) as a class and consider the stylistic choices made in the construction of this passage and the impact that it has on the reader. Now with consideration of narrative devices explored in the ‘close study’ section of this resource, students shall write in a style influenced by Winton’s prose. Through the consideration of an iconic and immediately locatable vernacular (which need not be Australian), considered narrative position and the ability to move the situation beyond the real, students will write a short passage retelling an event to the audience. A helpful comparison to the passage where Fish and the water become one (prologue) is the iconic short story by Julio Cortazar, Axolotl. It is a brief short story but really assists students in understanding the stylistic features of this movement and the comparisons to Winton’s work are quite easy to locate. This comparative task could be used as a classroom assessment for students where they are provided with both passages and asked to write a discussion such as ‘Discuss the way both texts develop our understanding by going beyond the real’. Individual writing task: Students should return to their original response to the text. Comparing their understanding of the text now to their initial response, they should write at least one paragraph addressing any comparisons or differences in understanding between then and now. Panel discussion: A critical reading task for students. Provide the following as an instruction. Watch this episode of the ABC’s First Tuesday Book Club. Note how each panel member responded to the text and the justifications they gave for certain views, opinions and readings. Create your own panel discussion of Cloudstreet but remember that your views of the text need to be carefully expressed and substantiated. You don’t want to be the uninformed panel member. You will need five people and some general questions to guide the discussion. Nominate one of the group to chair your discussion (be the Jennifer Byrne of your panel) and limit your discussion to 15 minutes. Challenge yourself to consider your own reading context in your response to the text (some of the ABC panel members do this) and try to frame your comments with consideration of that context. Since its publication in 1991 Cloudstreet has received a number of literary awards, attracted praise on the page, stage and screen and found an important place in the heart of Australian readers. This is clearly seen by the number of polls in which Cloudstreet continues to rank number one as Australia’s favourite novel. The students’ task is to write a feature article in which they explain the reasons for Cloudstreet‘s popularity. They may agree or disagree as to whether they feel the novel’s place in the nation’s heart is deserved, but ultimately must provide a reasoned explanation for its appeal. The article should be between 1,000 and 1,500 words and provide close reference to the text as justification for your comments (teachers may amend work requirements depending on state course requirements). Consider that the article will be published in a publication such as The Weekend Australian, and should adhere to the conventions of grammar and expression expected of this form. This page contains a comprehensive list of many helpful articles and academic essays that would be beneficial to teachers and students. Watzke, B. “Where Pigs Speak in Tongues and Angles Come and Go: A Conversation with Tim Winton.” Antipodes 5(2), 1991: 96-98. Duration This resource is intended as a guide for teachers to shape a teaching program. It is recommended that studying this novel in a comparative style should take between four to six weeks. Cloudstreet is a novel with complex themes that is sophisticated in its construction, as well as its connection to other works of literature. The novel also contains some situations that would not be appropriate to explore with younger students. Studying Winton’s novel within Unit 3 of the Australian Curriculum: English course allows for close reading of the novel as well as exploring important intertextual comparisons relating to style, construction, thematic similarities and contextual connections. Please note that this resource contains suggested activities. Teachers should choose from the activities to create their own teaching program. Completing all of the activities would make this program longer than the suggested duration below. CLAIRE JONES has been an English, Literature and History teacher in Western Australia and the United Kingdom. She has been a classroom teacher, Head of English, state examiner, curriculum writer and chief marker of Western Australia’s WACE English course. She is currently teaching at Curtin University in the School of Education and works as a researcher in Australian Literature at the University of Western Australia where she is also completing her doctorate in Literature.